Also known as Birds Nest Drink, I recently got some from family, who bought it from Costco. 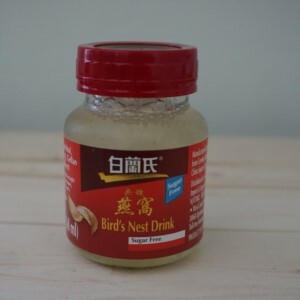 It's by Golden Nest and claims to have 100% genuine swallow bird nest. I tried a pre-chilled bottle and it tasted fine with some soft chunks of what I assumed to be the actual bird's nest. Regarding the drink itself, I felt it was a bit sweet, and there is 14 grams of sugar. It's the saliva of the nest of the swiflets. Male swiftlets build the nest with the saliva, which forms a type of salivary glue (imagine a cement) for their nest. Different varieties and grades of bird's nest are available. Harvested bird's nest can be cooked into a soup or drink. Traditionally harvested in limestone caves by climbing up tall ladders... quite dangerous! Cleaned by removing twigs and feathers that are also part of the bird's nest. The popularity has created "farms" of concrete builds designed to breed and harvest bird's nest. Popularity has attracted counterfeits: even China has banned some imports of Bird's Nest. Cleaning fresh Bird's Nest is best done with cold water, as opposed chemicals that deplete nutritional value. Not considered (by me) to be unethical to swallow because it's harvested after the bird's leave and abandon the nest. Bird's Nest can cost up to $4,500/lb. Costco Sells Bird's Nest Drink: 8 x 8oz bottles for $20. Different grades of bird's nest can fetch different prices. Health benefit reasons, discussed in more details below. A sign of luxury, similar to shark fin soup. At a restaurant during a business meeting, bird's nest soup is ordered a sign of good faith. Suggested best time to consume is on an empty stomach: either in the morning or right before bedtime. Experts recommend 3 grams for those between 1 to 12 years. 5-10 grams for everyone else. Don't cook over 100C, which would destroy nutritional value. Soup should be prepared in a double boiler for 20 minutes max. Can be prepared with rock sugar, ginseng, red dried dates, dried longans, fresh ginger, egg white, pandan leaves. Soak dried bird's nest overnight in cold water to soften and expand. Little research has been performed on biological function of Bird's Nest. Saliva has high levels of calcium, iron, potassium, and magnesium. High in Epidermal Growth Factor (EGF), beneficial for skin. Believed to improve concentration and raise libido. Good for Pregnant Women: helps with stretch marks due to collagen, can help reduce risk of pre-eclampsia. Not recommended for pregnant women during the first trimester. Some people have negative reactions: anaphylaxic. Try a small amount first, to test for allergies!